On board for the 4 days 4 nights were Steve and Jo, repeat customers of Scuba Cat Diving, last time they were on board MV Scuba Cat where Steve proposed to Jo underwater. That was 5 years ago as well as Wendy, Andreas, Mikkel and John. 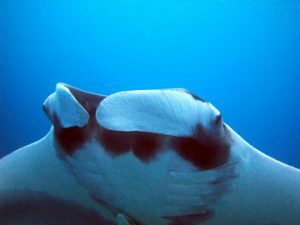 After a very successful check dive on Anita’s Reef, Island 4 in the Similans they headed straight to Koh Bon as Captain Pu had heard reports of a giant manta sighting. Needless to say, a couple of hours later they were there enjoying the moment with the manta and 30m visibility. Very lucky indeed, they had the manta to themselves. During the second Dive on Koh Bon the manta made came back and joined them all to say goodbye! The next day Richelieu Rock had fantastic visibility with so much action. 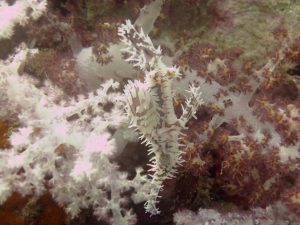 Many glassfish being hunted by their predators, school of barracuda’s, bent stick pipefish, cleaner pipefish and SO much more including the tiniest sea horse sitting on a sea fan. They did 3 dives there with minimal current. 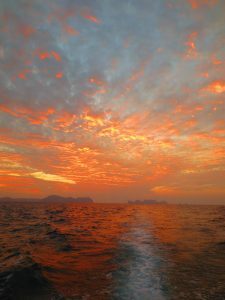 Back to Koh Tachai, for the sunset dive. “Just like being in another world” quoted Jo Willett. The huge school of barracudas were there for the duration. 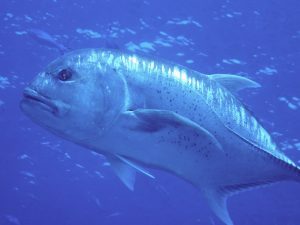 Kath’s favourite dive site delivered with the trevally feeding frenzy, snappers, napoleon wrasse & marble groupers. This site was repeated the next morning and the highlight saw 2 large schools of barracuda merging together. Thankfully Koh Tachai was also kind with almost no current. Koh Bon, for the third dive of the day and yet again…. Mantas!!!! The gangsters of the ocean, the Trevallies were feeding on glassfish and for good measure a Napoleon wrasse graced them with its presence. 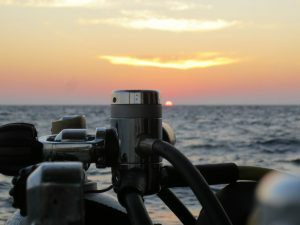 When they surfaced there were many other liveaboard boats, the decision was made to leave the manta experience on a high and head back to the Similans, Christmas Point on Island 9 to enjoy the unique swim through’s. Amongst other things Kath spotted a white tip reef shark as it swam straight across her. Next West of Eden, Island 7…. they didn’t need to go diving! A teeny-tiny whale shark came alongside MV Scuba Adventure, 2m maximum! (Doesn’t sound tiny does it!) The lucky customers were kitting up on the back deck when it came to say hi. Day 4, Deep Six for the morning dive. Hoping to see the whale shark as it was in the area the day before. Great swim throughs and a white tip spotted again by Kath at 27.5m. Unfortunately, no one else saw it. Many fusiliers and banner fish. 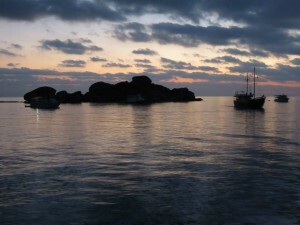 The last dive of the Northern trip was on Shark Fin Reef, declared as “incredible” with 40m visibility. It was like diving in an aquarium. The neon fusiliers were like a train that never stopped!!! They were very fortunate to see a bump head parrot and an eagle ray. What a treat! Huge Congratulations to John who completed his Advanced Open Water on board Scuba Adventure. 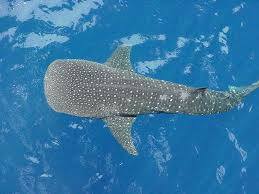 This entry was posted on Sunday, February 23rd, 2014 at 10:41 am	and is filed under Liveaboards, Similan Islands, South Andaman Dive Safari. You can follow any responses to this entry through the RSS 2.0 feed. Both comments and pings are currently closed.